This is one of my favourite dishes for a work lunch! Bring 2 cups water to boil in a saucepan. Add 1 cup rice, 1 teaspoon olive oil and 1/2 teaspoon salt. Cover with a lid and reduce to a simmer. Simmer for 15 minutes, then remove from heat. Do not take the lid off at any time. Let the rice rest for another 15 minutes, with the lid on at all times. I like to spread the rice then on a cookie sheet for about 5 minutes so it can come to room temperature. 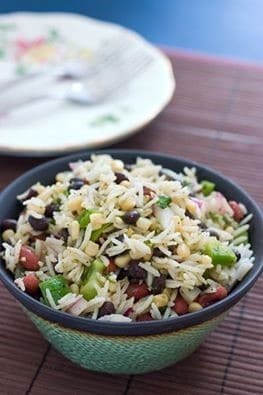 Add corn, beans, green pepper, onions, garlic, cilantro, vinegar, oil and cumin to a large mixing bowl. Mix well to combine. Add rice and mix. Add salt and pepper to taste. Serve at room temperature or chilled.